Are you hosting a Baby Shower for a friend or family member? Choosing a theme and picking out invitations and supplies can be a lot of fun, so many great styles and themes to choose from. Whether the baby shower is for a boy or girl or the gender is yet unknown you'll find some really sweet themes and ideas here. 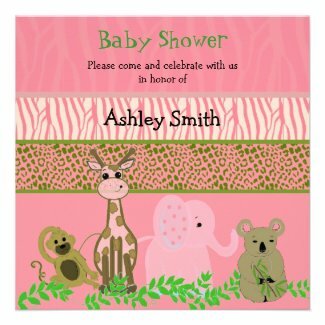 Baby animals like elephants, hippo's and giraffes are popular for baby shower themes. Trendy designs like baby buggies, sailboats and umbrellas along with fun modern designs can be found on several invitations too! shower favors, gift wrap and other cute baby products under the drop down menus up top. Download this sweet 'star' gift tag to your desktop, open and print! This website participates in the Zazzle.com Associates Program. This affiliate advertising program designed to provide a means for sites to earn advertising fees by advertising and linking to Zazzle.com.